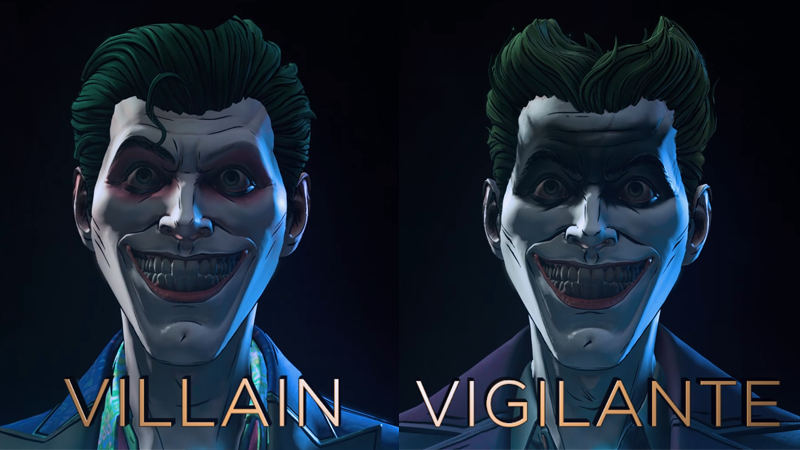 Villain or Vigilante should come down to something more morally conscious than “who has the better hair?”, but honestly bad guy Joker wins here. The second season of Telltale’s excellent Batman game has seen players wrestle with a plotline quite unlike anything they’ve been tasked with before: befriend the man who could one day become the Joker, and have the chance to mold his future. Now two new trailers show how that could come to pass in some very different ways. Over the past four episodes of Batman: The Enemy Within, players have encountered John Doe, a former Arkham patient who has spent this season, alongside Bruce, getting deeply involved in the criminal exploits of Harley Quinn’s gang of villains, and the sinister Agency headed by Amanda Waller. Now, next week’s final episode will take all the decisions you’ve made as you’ve interacted with John over the series as he finally breaks down and becomes the Joker. Will he be Batman’s greatest foe? Or could he become an unpredictable ally in his fight for vigilante justice (with some questionable hairstyling choices, to boot)? Both trailers for the “Villain” and “Vigilante” paths in the episode are surprisingly different—it’s a rare moment of a seemingly major divergence, something Telltale’s brand of dialogue-driven adventure games has always struggled with, sometimes giving them a perception of them offering the mere illusion of choice. But it seems like either way the Joker evolves is going to lead to some trouble for Batman... although the villain path seems like it could be creating a hell of a problem in the form of a great foe who knows an awful lot about the man behind the Batcowl. Batman: The Enemy Within’s final episode “Same Stitch”, hits Xbox One, PS4, PC, and mobile devices March 27.